To collect this pet, level 120 players need to enter the Waycrest Manor 5-man dungeon when the World Quest, Waycrest Manor: Witchy Kitchen is active. The group must pull the 3 quest NPCs in the kitchen, and keep them alive until they complete their "cooking" process. Executive Chef Daniel does not have to be kept alive. After the above steps are complete, players can defeat the kitchen staff (killing them is not necessary), and all group members should be able to accept a quest from the Delicious Chicken. WQ for this is currently active (12/13/2018) It appears to have been patched back into rotation with 8.1. Sadly, the quest can no longer be shared with party members. There was a world quest (Witchy Kitchen) up in the Waycrest Manor dungeon, so I went. As soon as we killed one of the target mobs in the kitchen, a Delicious Chicken showed up on the floor with a quest, giving Cutting Edge Poultry Science. 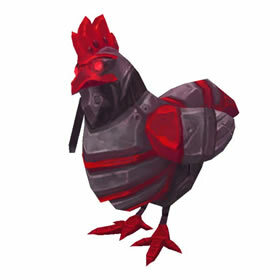 The wisest engineers of Azeroth all know that the only thing more dangerous than a living evil chicken, is the mind of an evil chicken transplanted into the body of a mechanical chicken.